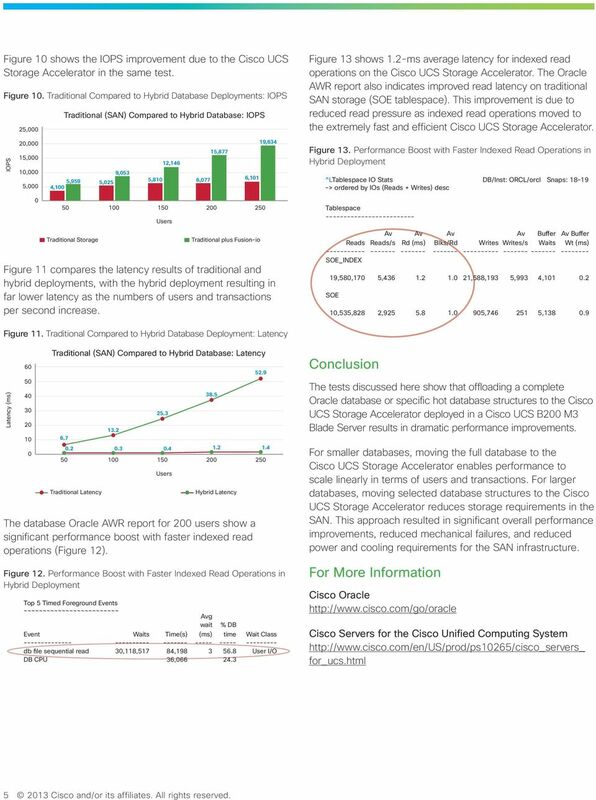 Download "Boost Database Performance with the Cisco UCS Storage Accelerator"
1 Boost Database Performance with the Cisco UCS Storage Accelerator Performance Brief February 213 Highlights Industry-leading Performance and Scalability Offloading full or partial database structures to a Cisco UCS 785GB MLC Fusion-io iodrive2 in the Cisco UCS B2 M3 Blade Server allows customers to improve performance of all applications, reduce IT costs through consolidation, manage more data on less hardware, and make better business decisions in real time. Improved Database Productivity with Less Maintenance and Tuning Overall productivity can be increased through the elimination of inherent problems that arise with spinning-disk solutions. Lower Costs Reduced storage infrastructure requirements result in significant cost reduction. 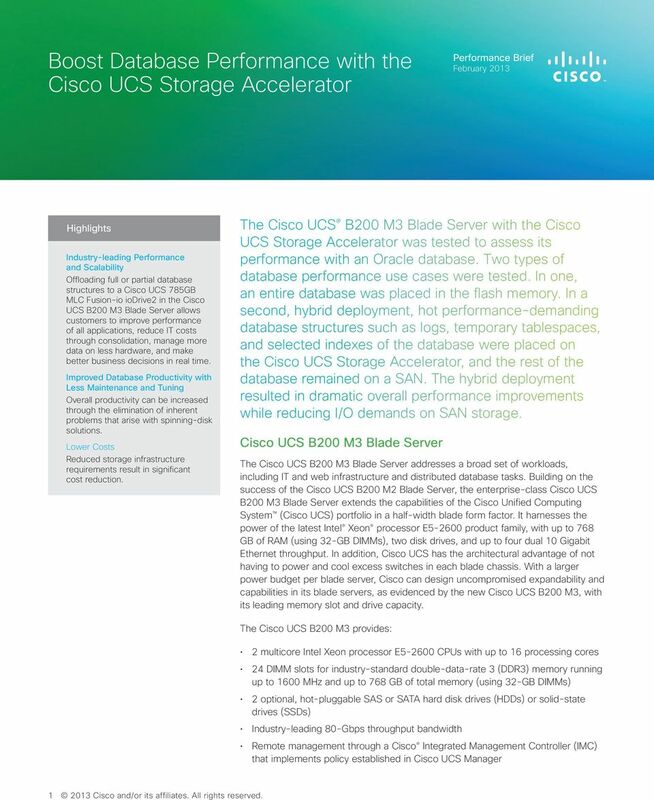 The Cisco UCS B2 M3 Blade Server with the Cisco UCS Storage Accelerator was tested to assess its performance with an Oracle database. Two types of database performance use cases were tested. In one, an entire database was placed in the flash memory. In a second, hybrid deployment, hot performance-demanding database structures such as logs, temporary tablespaces, and selected indexes of the database were placed on the Cisco UCS Storage Accelerator, and the rest of the database remained on a SAN. The hybrid deployment resulted in dramatic overall performance improvements while reducing I/O demands on SAN storage. Cisco UCS B2 M3 Blade Server The Cisco UCS B2 M3 Blade Server addresses a broad set of workloads, including IT and web infrastructure and distributed database tasks. Building on the success of the Cisco UCS B2 M2 Blade Server, the enterprise-class Cisco UCS B2 M3 Blade Server extends the capabilities of the Cisco Unified Computing System (Cisco UCS) portfolio in a half-width blade form factor. It harnesses the power of the latest Intel Xeon processor E5-26 product family, with up to 768 GB of RAM (using 32-GB DIMMs), two disk drives, and up to four dual 1 Gigabit Ethernet throughput. In addition, Cisco UCS has the architectural advantage of not having to power and cool excess switches in each blade chassis. With a larger power budget per blade server, Cisco can design uncompromised expandability and capabilities in its blade servers, as evidenced by the new Cisco UCS B2 M3, with its leading memory slot and drive capacity. The Cisco UCS B2 M3 provides: 2 multicore Intel Xeon processor E5-26 CPUs with up to 16 processing cores 24 DIMM slots for industry-standard double-data-rate 3 (DDR3) memory running up to 16 MHz and up to 768 GB of total memory (using 32-GB DIMMs) 2 optional, hot-pluggable SAS or SATA hard disk drives (HDDs) or solid-state drives (SSDs) Industry-leading 8-Gbps throughput bandwidth Remote management through a Cisco Integrated Management Controller (IMC) that implements policy established in Cisco UCS Manager Cisco and/or its affiliates. All rights reserved. 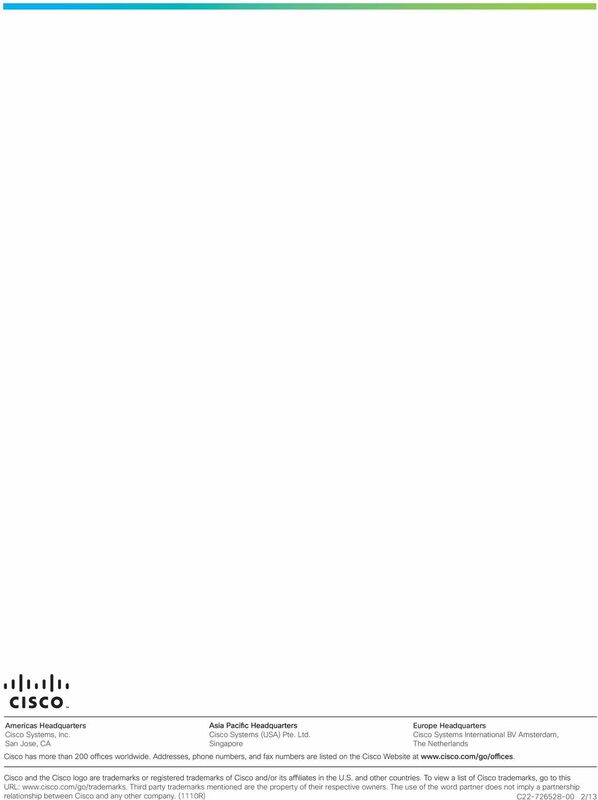 2 Out-of-band access by a remote keyboard, video, and mouse (KVM) device, Secure Shell (SSH) Protocol, and virtual media (vmedia) as well as the Intelligent Platform Management Interface (IPMI) The Cisco UCS B2 M3 is a half-width blade. Up to eight of these high-density, 2-socket blade servers can reside in the six-rack-unit (6RU) Cisco UCS 518 Blade Server Chassis, offering one of the highest densities of servers per rack unit in the industry. Cisco UCS 785-GB Multilevel Cell Fusion-io iodrive2 Adapter Fusion-io builds server-resident Peripheral Component Interconnect Express (PCIe) flash storage for applications requiring a high number of I/O operations per second () with low latency. Fusion s industry-leading, lowlatency iomemory eliminates I/O bottlenecks to improve virtual machine workload capabilities in all servers, allowing organizations to achieve the full potential of virtualization. The Cisco UCS Storage Accelerator significantly reduces Oracle database latency with a high-capacity, highperformance memory tier. The adapter offers a persistent storage option, enabling the card in a server to load an entire database of less than 785 GB into the card s flash memory or just the performance-demanding structures of a larger database. Offloading storage requirements to the card from the SAN and closer to the server can significantly increase performance. This hypothesis was proven in the online transaction processing (OLTP) database tests discussed in this document. 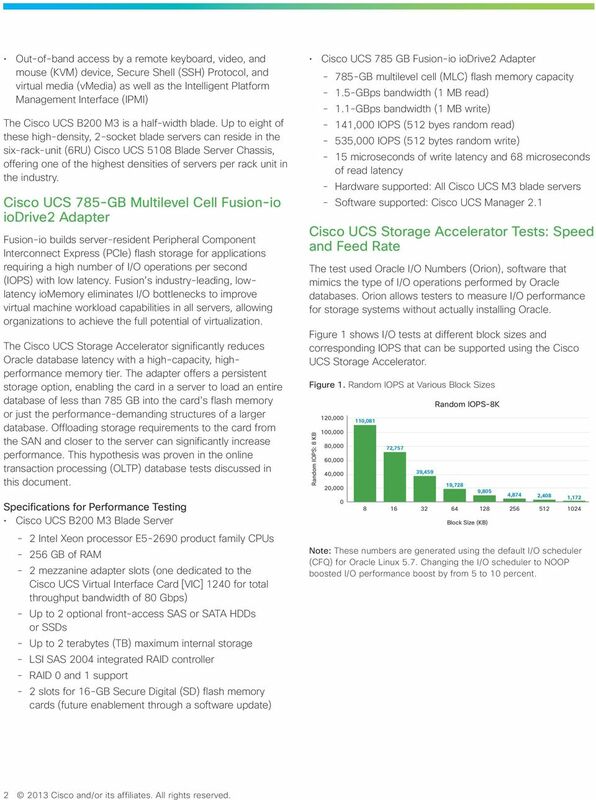 Specifications for Performance Testing Cisco UCS B2 M3 Blade Server 2 Intel Xeon processor E5-269 product family CPUs 256 GB of RAM 2 mezzanine adapter slots (one dedicated to the Cisco UCS Virtual Interface Card [VIC] 124 for total throughput bandwidth of 8 Gbps) Up to 2 optional front-access SAS or SATA HDDs or SSDs Up to 2 terabytes (TB) maximum internal storage LSI SAS 24 integrated RAID controller RAID and 1 support 2 slots for 16-GB Secure Digital (SD) flash memory cards (future enablement through a software update) Cisco UCS 785 GB Fusion-io iodrive2 Adapter 785-GB multilevel cell (MLC) flash memory capacity 1.5-GBps bandwidth (1 MB read) 1.1-GBps bandwidth (1 MB write) 141, (512 byes random read) 535, (512 bytes random write) 15 microseconds of write latency and 68 microseconds of read latency Hardware supported: All Cisco UCS M3 blade servers Software supported: Cisco UCS Manager 2.1 Cisco UCS Storage Accelerator Tests: Speed and Feed Rate The test used Oracle I/O Numbers (Orion), software that mimics the type of I/O operations performed by Oracle databases. Orion allows testers to measure I/O performance for storage systems without actually installing Oracle. Figure 1 shows I/O tests at different block sizes and corresponding that can be supported using the Cisco UCS Storage Accelerator. Figure 1. Random at Various Block Sizes Random : 8 KB 12, 1, 8, 6, 4, 2, 11,81 72,757 Random -8K 39,459 19,728 9,85 4,874 2,48 1, Block Size (KB) Note: These numbers are generated using the default I/O scheduler (CFQ) for Oracle Linux 5.7. Changing the I/O scheduler to NOOP boosted I/O performance boost by from 5 to 1 percent Cisco and/or its affiliates. All rights reserved. 3 Figure 2 shows the bandwidth tests at various I/O bandwidth sizes. Figure 2. Bandwidth Tests MBps 1,4 1,2 1, ,137 I/O Bandwidth 1,233 1,233 1,226 1,219 1,24 1, Block Size in KB Figure 3 shows I/O and latency tests at various read write ratios. Figure 3. and Latency for Read-Write Ratio 8, 7, 6, 5, 4, 3, 2, 1, 72, Orion: 8-KB and Latency for Read-Write Ratio 48, , , , ,856 25,592 24,242 24,363 24, Percentage of Write Operations Test Case 1: Placing an Entire Database in Flash Memory Test case 1 uses an entire single instance of an Oracle 11gR2 database of 72 GB with all database structures on a persistent Cisco UCS Storage Accelerator (Figure 4). The tests used swingbench order entry, which is an OLTP workload, and a 64-GB system global area (SGA) for the Oracle database Latency For small and medium-sized businesses, departmental databases, and quality assurance groups running smaller databases (less than 785 GB), an entire Oracle database is shown to perform excellently on a Cisco UCS Storage Accelerator in a Cisco UCS B2 M3 Blade Server. Scalability tests were run against a 72-GB database, with users scaling from 5 to 25 in increments of 5 users. The tests showed near-linear performance in the number of transactions for per second (TPS) as the number of users scaled. While running 25 users tests, data set concurrency problems occurred that resulted in slightly reduced TPS and higher latency. This result typically indicates that too many users are running against a small data set, and not a hardware limitation. Figure 4. 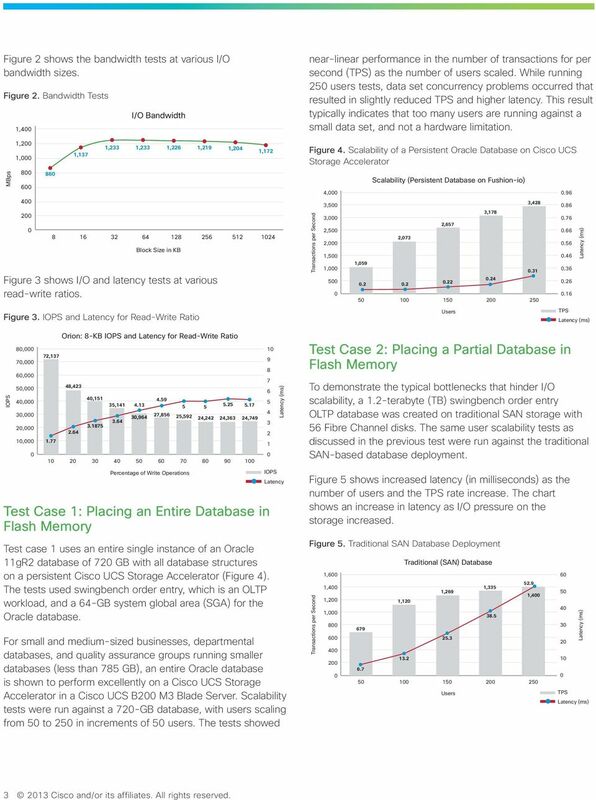 Scalability of a Persistent Oracle Database on Cisco UCS Storage Accelerator 4, 3,5 3, 2,5 2, 1,5 1, 5 1,59 Scalability (Persistent Database on Fushion-io) 2, , , , Test Case 2: Placing a Partial Database in Flash Memory TPS To demonstrate the typical bottlenecks that hinder I/O scalability, a 1.2-terabyte (TB) swingbench order entry OLTP database was created on traditional SAN storage with 56 Fibre Channel disks. The same user scalability tests as discussed in the previous test were run against the traditional SAN-based database deployment. Figure 5 shows increased latency (in milliseconds) as the number of users and the TPS rate increase. The chart shows an increase in latency as I/O pressure on the storage increased. Figure 5. Traditional SAN Database Deployment 1,6 1,4 1,2 1, , Traditional (SAN) Database 1, , , TPS Cisco and/or its affiliates. All rights reserved. 4 Figure 6 show that this storage configuration reaches an I/O bottleneck at 61. This behavior is confirmed in an Oracle Automatic Workload Repository (AWR) report shown in Figure 7. Figure 6. Traditional SAN Database Deployment: Scalability Limited by I/O Bottleneck 7, 6, 5, Traditional SAN Storage: 5,25 5,81 6,77 6,11 Limited Scalability Because of I/O Bottleneck Figure 8. Traditional SAN Database Deployment: Corresponding Latency ^LTablespace IO Stats > ordered by IOs (Reads + Writes) desc Tablespace - Reads - SOE 11,824,296 UNDOTBS1 Reads/s Rd (ms) Blks/Rd - 1. Writes 7,614,64 DB/Inst: ORCL/orcl Snaps: Writes/s - 2,144 Buffer - 6,656 Buffer Wt (ms) 2.7 4, 3, 4, , , 1, Figure 7 shows the Oracle AWR report Top 5 wait events for a 2-user test. In the traditional deployment based on 2 users, 91 percent of the total time is spent on the db_ file_sequential_read wait event. This wait event is typically the result of indexed reads that are single-block (8 KB) reads. This report identifies index tablespace, or some of the indexes, as the best candidates to move to flash memory. Figure 7. Traditional SAN Database Deployment: Oracle AWR Report Top 5 Wait Events Top 5 Timed Foreground Events ~~~~~~~~~~~~~~~~~~~~~~~~~ Event db file sequential read log file sync 11,857,859 2,842,14 Time 456,882 23,32 g wait (ms) % DB time Wait Class - User I/O Commit The Tablespace IO Stats section in the same Oracle AWR report shows an average latency of 38.5 milliseconds (ms), which is very high. The indexed read operations can also be confirmed through average number of blocks read, shown in Figure 8. As a next logical step, a separate scale order entry (SOE) index tablespace named SOE_INDEX was created on the Cisco UCS Storage Accelerator, and all indexes were moved there. Figure 9 shows that this operation increased performance by more than 3 percent compared to a traditional SAN deployment. This increased work is also achieved with significantly less latency. 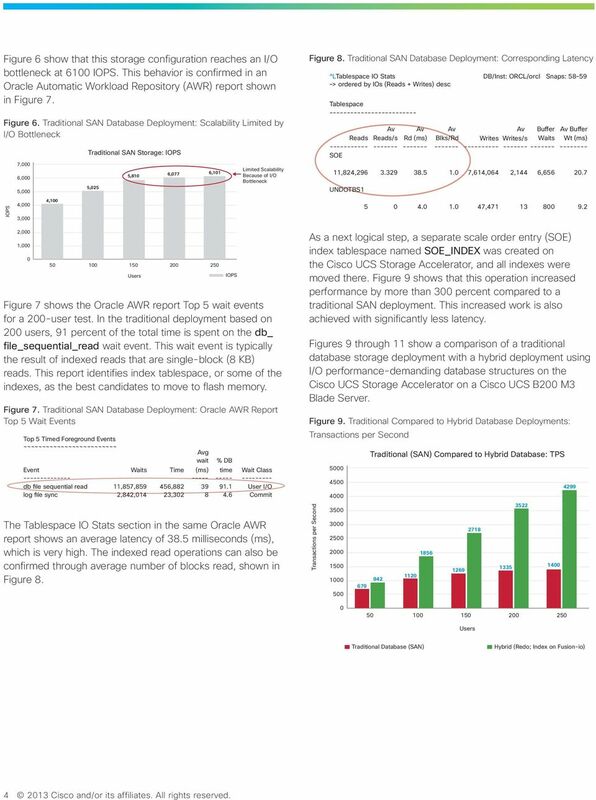 Figures 9 through 11 show a comparison of a traditional database storage deployment with a hybrid deployment using I/O performance-demanding database structures on the Cisco UCS Storage Accelerator on a Cisco UCS B2 M3 Blade Server. Figure 9. Traditional Compared to Hybrid Database Deployments: Traditional (SAN) Compared to Hybrid Database: TPS Traditional Database (SAN) Hybrid (Redo; Index on Fusion-io) Cisco and/or its affiliates. All rights reserved. Cisco UCS B200 M1 and UCS B250 M1 Blade Servers. Table 1 compares the features of the Cisco UCS B-Series Blade Servers.